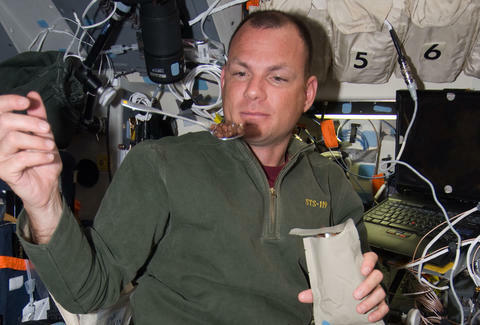 Even though they could probably just be eating Thanksgiving-flavored potato chips, the six astronauts aboard the International Space Station have a special Turkey Day menu planned. Granted, only two of them are American, but who doesn't love freeze-dried turkey? The full meal for Expedition 42 (which includes American astronauts Terry Virts and Butch Wilmore) includes: freeze-dried irradiated turkey, thermostabilized candied yams, freeze-dried mushrooms, green beans & stuffing, and a dessert of thermostabilized cherry-blueberry cobbler (for the non-astronauts among us, "thermostabilized" means it was preserved by heat). Just like the Space Pilgrims used to eat! The ISS is currently floating approximately 268 miles above Earth. Research conducted on board has shown that sweet potato actually grows well in space, so that might be on the menu in the near future. Until then, thermostabilized candied yams will have to do. Bon appetit, guys. Adam Lapetina is a Food/Drink staff writer for Thrillist, and thinks being on Earth is pretty neat. Read his musings at @adamlapetina.